Next week the Extreme 40s head into the final battle of the 2012 Extreme Sailing Series in Rio de Janeiro, Brazil – the same city due to host both the FIFA World Cup Final in 2014 followed by the 2016 Olympic Games. Representing the nation as a wildcard entry will be Team Brasil, with renowned sailor and Brazil’s most successful Olympian Torben Grael, leading the team as skipper. Torben, who boasts an incredible five Olympic medals including two golds, is a fitting leader for a team that is a tribute to Brazil’s Olympic medallists and future stars. He will be joined by his son Marco, the next generation of Graels going for glory at the Olympics as he campaigns his 49er dinghy for Rio 2016. Torben’s brother Lars Grael, himself a holder of two Olympic bronze medals in Tornado from Seoul and Atlantia, will be coaching and acting as reserve crew, making it a real family affair. The Grael clan will be joined by sailors of equally impressive stature. 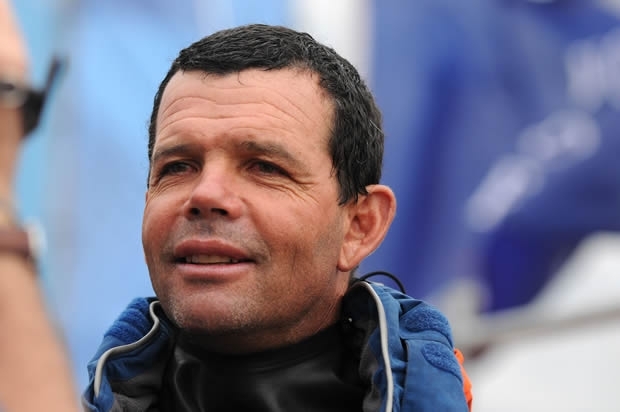 Portuguese sailor Diogo Cayolla can list the Olympics, America’s Cup and a host of national titles on his CV, as well as previous Extreme 40 experience; while Brazilian Alex Welter brings his catamaran expertise into the mix including an gold medal from the Moscow Olympic in the Tornado class. The final crew member André Mirsky brings experience in the Olympic Star class and thousands of offshore miles to the fray. For the eight established Extreme 40 teams, the stakes are high with four teams capable of lifting the 2012 Extreme Sailing Series overall trophy – two Omani, one French and one Austrian. None of them want to go home empty handed and with 15 points up for grabs in the final event, the podium is wide open. One team will head to the final feeling a little more comfortable than the others, safe in the knowledge that they have guaranteed themselves a podium position regardless of the final outcome. Leigh McMillan’s The Wave, Muscat has been sitting pretty at the top of the leaderboard since winning in Qingdao. However, their leading position is far from guaranteed with three other teams champing at the bit to stop The Wave, Muscat in their tracks. Pierre Pennec put his French team Groupe Edmond de Rothschild back in the fray in Nice with a win on home waters, leaving them in third place, but just two points shy of Oman Air on 51 while the Austrian Red Bull Sailing Team hold fourth on 48.5 points. And with 179 races down this year and up to 32 more to come in Rio de Janeiro, Red Bull skipper Roman Hagara is all too aware of what is at stake. “We are not going to be looking at the other teams and will focus on our own performance. We have analysed our disappointing result from Nice (the team finished in sixth place) and have to fight back in Rio now." While these four teams will fight for overall victory, another battle has developed mid-fleet. Andrew Walsh is back at the helm of GAC Pindar with a five point lead over 2012 Series newbies SAP Extreme Sailing Team and both teams are gunning for their first podium positions. “We have been close to a podium finish at the previous Acts of the Extreme Sailing Series, and we hope that a more consistent performance will take us the last step onto the podium in Rio de Janeiro," explained SAP Extreme Sailing Team’s co-skipper Rasmus Kostner. The action begins on 6 December in open water in front of Copacabana beach before moving into stadium mode for the final three days where the world famous statue of Christ the Redeemer will be watching over the Extreme 40s. International fans can watch the racing live on the official event website from the 1500 (GMT-2) on the 7-9 December.